RVD Lecture: Anousheh Ansari | Space Agenda, The space related events calendar! Always had dreams about becoming an astronaut but thinking you will never have the chance? 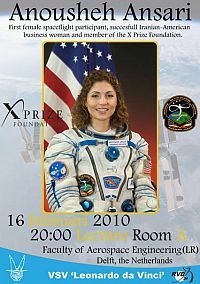 Anousheh Ansari was just like you and went down in history as the first female private space explorer. As the title sponsor of the X-Prize foundation she inspired many people to pursue their passion, for example the team that invented SpaceShipOne. She also co-founded a successful technology company where she held the position of CEO and chairman. Tuesday February the 16th at 20.00hr, Anousheh will give a lecture in LR A on her experiences and her current work in which she enables social entrepreneurs to bring about radical change globally.